First Jewish Sheriff of Broward County picks representative of terror group to wear gun and badge. The Council on American-Islamic Relations (CAIR) has its foundation in the terrorist organization Hamas. It has been named as a co-conspirator by the U.S. government for two federal trials dealing with the financing of Hamas, and it is recognized as an international terrorist group by the government of United Arab Emirates (UAE). Given this information, how is it possible that one of this group’s leaders, Nezar Hamze, could be considered for a position at one of the most prominent Sheriff’s offices in the United States? However, that is exactly what has happened. The Broward Sheriff’s Office (BSO) is the largest fully accredited Sheriff's office in the nation. As such, having the title of Sheriff comes with much fanfare and responsibility. The current Sheriff is Scott Israel; he was elected to office in November 2012. As Sheriff, Israel has made it a point to reach out to diverse crowds, including those who could be considered enemies of the U.S. and her allies. Broward Sheriff Scott Israel’s 2015 radical Muslim tour began this past January, when he posed for photos with Sofian Abdelaziz Zakkout and a member of Zakkout’s Miami-based AMANA group at a local mosque. Zakkout is a big supporter of Hamas. 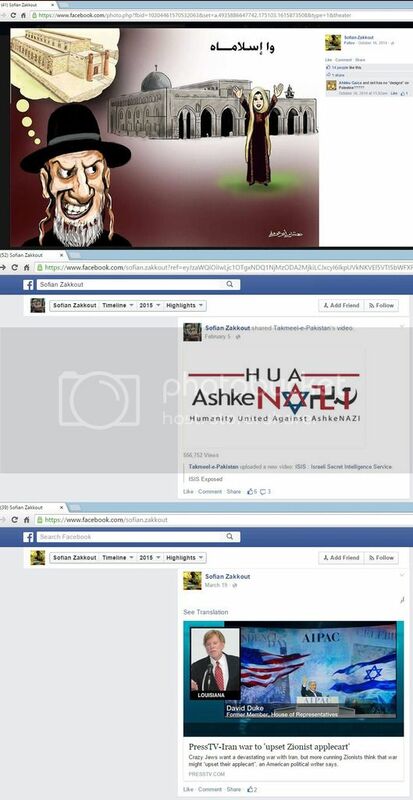 On his Facebook page, one can find Hamas logos and photos of Hamas militants and leaders, including Hamas founders Ahmed Yassin and Abdel Aziz al-Rantisi and deceased Hamas bomb maker Yehiya Ayyash. Zakkout is also a big fan of white supremacist and former Grand Wizard of the Ku Klux Klan, David Duke. Zakkout has posted different links on his Facebook site to Duke videos , including a link to Duke’s official YouTube page. In July 2010, the Anti-Defamation League (ADL) condemned Zakkout’s group AMANA for featuring what it called a “vicious” David Duke video on its website. In the video, which is titled ‘No War for Israel in Iran – Keep Americans Safe,’ Duke rails against Jews and is shown shaking hands with then-Iranian President Mahmoud Ahmadinejad. Like he did with Zakkout, Sheriff Israel posed for photos, one of which has him standing alongside Mayor of Sunrise, Florida Mike Ryan and the co-founder and co-chairman of Emerge, Khurrum Wahid. Wahid, a South Florida attorney, has spent years representing high-profile Muslim terrorists. They include: Rafiq Sabir, who received a 25-year prison sentence for conspiring to provide material support to al-Qaeda; Ahmed Omar Abu Ali, who was given a life sentence for being part of al-Qaeda and for plotting to assassinate President George W. Bush; Sami al-Arian who spent time in prison (and was later deported) for his activities within Palestinian Islamic Jihad (PIJ); and Hafiz Khan, a Miami imam who received 25 years for shipping $50,000 to the Taliban explicitly to murder American troops overseas. The third stop of Sheriff Israel’s radical Muslim tour, which took place this month, led him to the Darul Uloom Mosque, located in Pembroke Pines, Florida. Darul Uloom has ties to a number of high-profile al-Qaeda terrorists. “Dirty Bomber” Jose Padilla was a student at Darul Uloom. His teacher was the current imam at the mosque, Maulana Shafayat Mohamed. Padilla was sentenced to 21 years in prison for providing material support to terrorists and for conspiracy to murder, kidnap and maim individuals overseas. Now-deceased al-Qaeda commander and al-Qaeda Global Operations Chief Adnan el-Shukrijumah was a prayer leader at the mosque. In 2010, Shukrijumah was indicted by New York authorities for plotting suicide bombings in the city’s subway system. His father, Gulshair el-Shukrijumah, who was a translator for the spiritual leader of the 1993 World Trade Center bombing, “Blind Shaikh” Omar Abdel-Rahman, taught classes at Darul Uloom. One of Gulshair’s students, Imran Mandhai, was sentenced to twelve years in prison for plotting to blow up strategic targets in South Florida. Mandhai was deported to Pakistan this past May. It has further been alleged that one of the 19 hijackers from the September 11 attacks prayed at Darul Uloom. The photo of Shafayat Mohamed with Deedat, whom Shafayat Mohamed said he “had a good relationship” with, was taken in Durban, South Africa, at what was then named the Bin Laden Center. Deedat, who according to the New York Times was “a vocal anti-Semite and ardent backer of Osama bin Laden,” personally received millions of dollars from Bin Laden for the center. Sheriff Israel arrived at Darul Uloom to deliver a Ramadan message to the crowd; he did so, before being warmly embraced by the imam, Shafayat Mohamed. But the real message was sent by the individual who was introducing the Sheriff. It was Deputy Sheriff Nezar Hamze. This was an alarming and surreal surprise, as Hamze has been a leader of a local chapter of the Hamas-associated CAIR for the past five years. Hamze is the Regional Operations Director of CAIR-Florida. Previously, he served as CAIR-Florida’s Executive Director. CAIR was established in June 1994 as being part of the American Palestine Committee, an umbrella organization acting as a terrorist enterprise run by then-global Hamas leader Mousa Abu Marzook. Marzook, at the time, was based in the U.S and currently operates out of Egypt as a spokesman for Hamas. In 2007 and 2008, amidst two federal trials, the U.S. government named CAIR a co-conspirator in the raising of millions of dollars for Hamas. Under a graphic of the World Trade Center in flames, CAIR posted to its national website a link to the Hamas charity, Holy Land Foundation for Relief and Development (HLF), asking its followers to donate money. The group also asked its followers to donate to the al-Qaeda charity, Global Relief Foundation (GRF). In November 2014, just eight months ago, along with ISIS, al-Qaeda and Boko Haram, CAIR was named a terrorist organization by United Arab Emirates (UAE). Hamze has his own anti-social and dangerous issues, apart from being a CAIR leader. In December 2010, outside a fundraiser for then-Member of Parliament of the United Kingdom, George Galloway, being held at the Islamic Center of South Florida (ICOSF), in Pompano Beach, Hamze was caught on video repeatedly refusing to denounce Hamas, when given numerous chances to do so. All of this would seem to make someone like Nezar Hamze ineligible to serve in any capacity within law enforcement and would render his designation as Deputy Sheriff untenable. Yet, there was Hamze, at Darul Uloom, in full uniform with firearm at his side. Can Sheriff Israel, the first Jewish Sheriff in Broward County, seriously believe that Nezar Hamze – a man who has spent years as a leader of a fanatic Muslim organization; a man who repeatedly refused to denounce Hamas when given numerous chances; a man who tried to make excuses for his murderer cousin, after his cousin had willfully ran over a woman, dragged her body for several miles, and then tried to flee the country – should serve as a Deputy Sheriff in one of the most prominent Sheriff’s offices in the nation?!! By employing Nezar Hamze, Sheriff Scott Israel has compromised not only the Broward Sheriff’s office, but the security of the entire county and by extension U.S. national security. And with the intelligence information made available to someone in Hamze’s position and the misleading information Hamze has exhibited he is capable of providing, who knows how much damage this could cause! If the situation is not corrected and Nezar Hamze is not dismissed from his position immediately, Sheriff Israel should resign from office immediately. If you wish to contact Sheriff Israel, you can do so by sending an e-mail to: [email protected], or you can call the Broward Sheriff’s Office, at 954-764-4357. Please be respectful in any and all communications with this office.